I was just recipe-surfing online and came across the term “vegan curious”. That label kind of works for me. I never would have predicted that I would change my eating habits so drastically when I moved to Yosemite (but then I don’t think there’s a way I could’ve predicted how much my lifestyle would change because of that move either). I used to eat just about anything that was delicious… meat, fish, eggs, ice cream, all manner of desserts actually, whatever. Now I’m totally vegetarian – no meat or fish ever. I also don’t eat eggs and have lost my taste for ice cream. Technically I’m not vegan because I do still consume dairy products (though pretty limitedly) and honey. One thing that hasn’t changed is my love of cooking. A good chunk of my spare time and efforts go into food preparation. And I’m always trying to improve on my favorite recipes, using local and organic products, eliminating dairy, etc. Of course, without sacrificing flavor. Recently I’ve been working on vegan-izing my flaky-layer biscuit recipe. Being from the south, biscuits are one of my very favorite foods (pretty much anything bread falls into my very favorite foods category though…). What I don’t like is all the butter that’s in my biscuits. So I found a way to substitute coconut oil. I think it worked! The trick is to freeze the coconut oil for a few minutes before blending it in… And, of course, baking in a cast iron! So I thought I’d share my recipe since I spend a lot of time developing my own recipes, but I rarely take the time to talk about food in my blog. preheat oven to 450˚F. blend dry ingredients in a bowl. scoop oil into a freezer-friendly container and let chill in the freezer for a few minutes (maybe 10 or so) before adding to dry ingredients. use a pastry blender to cut in oil until pieces are no larger than pea-sized. stir in milk to make a semi-dry dough. remove from bowl and knead dough by pressing into a disc, folding in half and re-pressing. repeat this a few times and then press out to desire thickness. you’ll want to work relatively quickly so the oil doesn’t heat up enough to turn into a liquid (which it does at 76 degrees). cut out biscuits and bake on an ungreased cookie sheet for 12 to 14 minutes or until golden brown. biscuits can also be cut and then frozen. 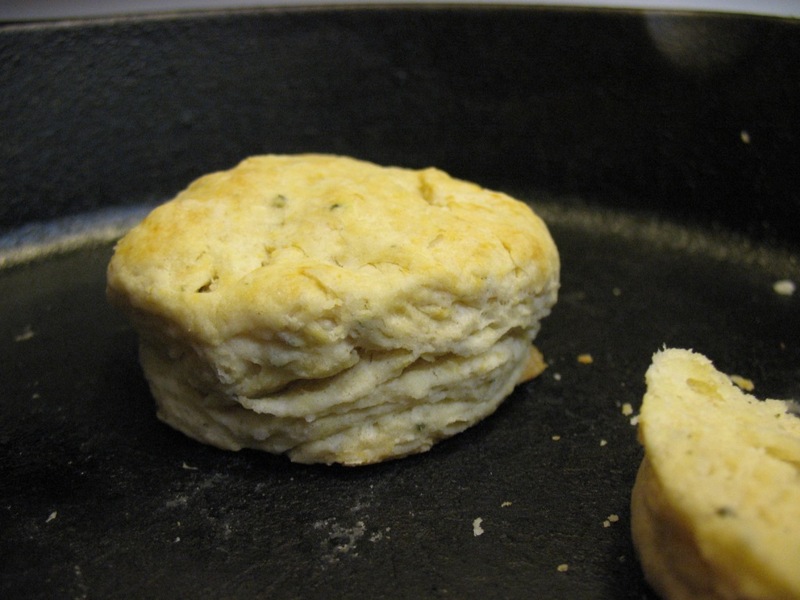 bake frozen biscuits at 350˚ for about 25 to 30 minutes. This entry was posted in Uncategorized and tagged biscuits, cooking, recipes, vegan, vegan curious. Bookmark the permalink. Hi Rachel! I just took a Whole Food Kitchen online workshop. Heather, the instructor, is currently offering a Vegan workshop. Thought you might like to check it out.